It does indeed belong to a badger. It seems that your identification skills are improving – perhaps in part due to having a useful reference like Will’s Skull Page available? The fact that the next most popular choice was the otter is also heartening – both are mustelids and they share numerous similarities, so even if you got this one wrong, chances are that you were still very close. Well done! I like badger skulls, because unlike pretty much all other skulls the lower jaw is securely attached by a tightly enclosed jaw articulation (see below), which makes them one of the most easily identified skulls. They also have a very robust and distinctive bullet-shape, ideal for a creature that spends its time pushing through leaf-litter and soil in search of their main diet of earth-worms. 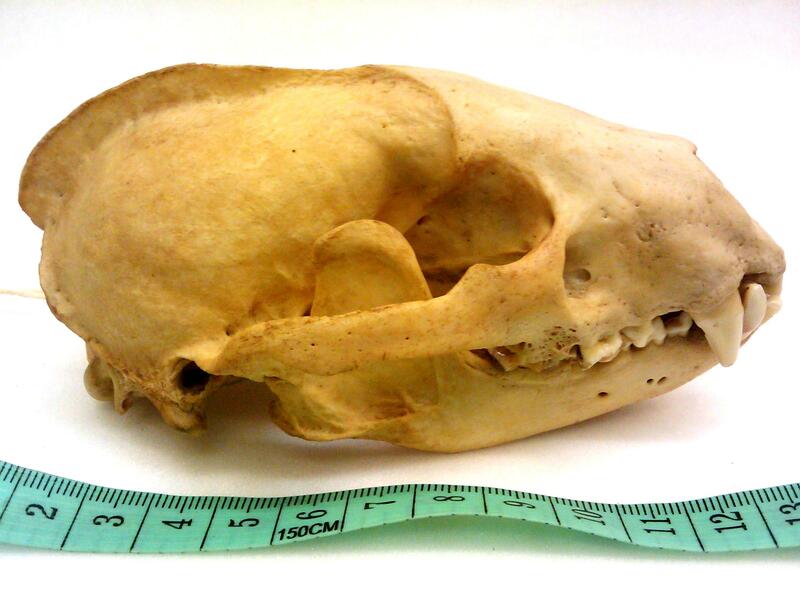 This diet explains why the badger’s molar teeth, which in other close relatives are modified into shearing blades called carnassials, are broad and flat – not very sharp at all. That’s stealth learning, that is! Ha! I learned you good. Sorry for not voting – I just didn’t have a clue! But now I know just a little bit more than I did a mintue ago… Thanks!